Fractures of the tibia and fibula most common in athletes, especially runners or non-athletes who suddenly increase their activity level. Many factors appear to contribute to the development of these fractures including changes in athletic training, specific anatomic features, decreased bone density, and diseases. 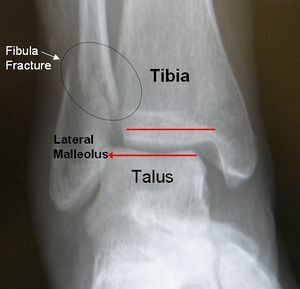 Fractures of the fibula sometimes occur with severe ankle sprains. It can happen anywhere along the fibula. The fibula only bears 17% of the body weight so these fractures are not as severe as weight bearing bone fractures. The fibula is a non-weight bearing bone that originates just below the lateral tibial plateau and extends distally to form the lateral malleolus, which is the portion of the fibula distal to the superior articular surface of the talus. The lateral malleolus provides key stability against excessive eversion of the ankle and foot. Proximally, the fibular head is the site of attachment of the lateral collateral ligament of the knee and of the tendon from the biceps femoris. Just below the fibular head the common peroneal nerve wraps around the fibular neck before dividing at the proximal fibula into deep and superficial branches. Along the upper and middle lateral border of the fibula, the Peroneal (Fibularis)Longus and brevis muscles originate and provide some soft tissue protection to the fibula from direct contusion. The fibrous attachment between the tibia and fibula, the tibiofibular syndesmosis, prevents displacement of the lateral malleolus. The distal portion of the syndesmosis has thickened fibers to form the distal tibio-fibular ligament. Stability of this ligament allows the ankle to remain stable with external rotation and during the forceful cutting movements required in many sports. Disruption of the syndesmosis (syndesmotic or high ankle sprain) contributes to instability of the tibiotalar joint. high-energy injuries such as motor vehicle injuries, pedestrians struck by motor vehicles, and gunshot wounds. Ankle fractures are classified according to Danis -Weber classification. Type A is a transverse fibular fracture caused by adduction and internal rotation. Type B, is caused by external rotation, it is shown as a short oblique fibular fracture directed mediolaterally upward from the tibial plafond. There are two type C fractures: type C 1 is an oblique medial-to-lateral fibular fracture which is caused by abduction. type C 2 fractures result from a combination of abduction and external rotation, producing more extensive syndesmotic injury and a higher fibular fracture. 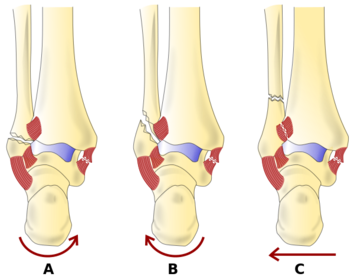 The Danis-Weber classification system uses the position of the level of the fibular fracture in its relationship to its height at the ankle joint. Type B: fracture at the level of the joint, with the tibiofibular ligaments usually intact. Type C: fracture above the joint level which tears the syndesmotic ligaments. Fibular fractures in adults are often caused by trauma. Isolated fibular fractures contain the majority of ankle fractures in older women, occurring in approximately 1 to 2 of every 1000 white women each year. Fibular fractures may also occur as the result of repetitive loading and in this case they are referred to as stress fractures. Bone mass is the key risk factor for fractures of the fibular or tibial shaft in older adults. Factors that reduce bone mass had greater impact than overall health status or other risk factors for falling. Cigarette smoking is another important risk factor for fibular fractures. Fibular fractures are more common among athletes engaged in sports that involve cutting, particularly those associated with contact or collision, for example American football, soccer and rugby . Participants in downhill winter sports have relatively high rates of fibular fractures. These are more common in snowboarding than skiing, and fracture patterns are different for each. Skiers often fracture the proximal third of the tibia and also the fibula, whereas snowboarders are more likely to sustain isolated fractures of the distal third of the fibula . Physical examination: A thorough examination will be conducted for any noticeable deformities. X-Rays are used to see the fracture and see if a bone has been displaced. Bone scans, CT Scans, and other tests may be ordered to make a more precise diagnosis and judge the severity of the fibula fracture. Sport test at 3-4 months based on progress . Do weight-bearing exercises to help strengthen bones. ↑ 1.0 1.1 1.2 https://www.uptodate.com/contents/stress-fractures-of-the-tibia-and-fibula (accessed 27 Januar 2019). ↑ https://ukhealthcare.uky.edu/orthopaedic-surgery-sports-medicine/sports-medicine/coaches-trainers/fibular-fracture (accessed 2 Februar 2019). ↑ Zammit J, Singh D. The peroneus quartus muscle. Anatomy and clinical relevance. J Bone Joint Surg Br 2003; 85:1134. ↑ Horwitz DS, Kubiak EN. Surgical treatment of osteoporotic fractures about the knee. Instr Course Lect 2010. 59:511-23. ↑ Hasselman CT, Vogt MT, Stone KL, et al. Foot and ankle fractures in elderly white women. Incidence and risk factors. J Bone Joint Surg Am 2003; 85-A:820. ↑ Makwana NK, Bhowal B, Harper WM, Hui AW. Conservative versus operative treatment for displaced ankle fractures in patients over 55 years of age. A prospective, randomised study. J Bone Joint Surg Br 2001; 83:525. ↑ Kelsey JL, Keegan TH, Prill MM, et al. Risk factors for fracture of the shafts of the tibia and fibula in older individuals. Osteoporos Int 2006; 17:143. ↑ Slauterbeck JR, Shapiro MS, Liu S, Finerman GA. Traumatic fibular shaft fractures in athletes. Am J Sports Med 1995; 23:751. ↑ Patton A, Bourne J, Theis JC. Patterns of lower limb fractures sustained during snowsports in Otago, New Zealand. N Z Med J 2010; 123:20. ↑ 11.0 11.1 11.2 11.3 https://www.medicalnewstoday.com/articles/315565.php (accessed 28 januar 2019). ↑ https://emedicine.medscape.com/article/826304-differential (accessed 28 Januar 2019). ↑ http://teachmesurgery.com/orthopaedic/ankle-and-foot/tibia-fibula-fractures/ (accessed 28 Januar 2019). ↑ http://nwomedicine.com/wp-content/uploads/2014/09/ProtocolAnkleORIF.pdf (accessed 28 Januar 2019). ↑ https://rcmclinic.com/patient-information/foot-and-ankle/orif-fibular-fracture-post-op/ (accessed 28 Januar 2019).